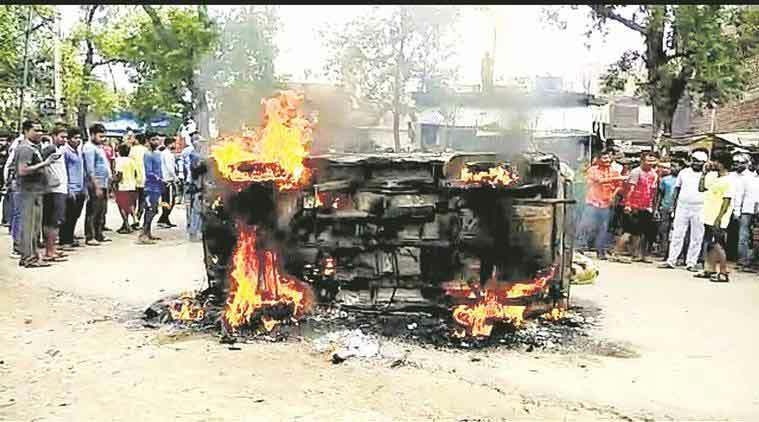 Alleging consumption of beef (cow meat) at a wedding reception hosted by 50-year old Jumman Miyan, a mob of hundreds of people attacked a locality of a particular community in Koderma district of Jharkhand. Some villagers reportedly found bones and remains of the banned meat in the field behind the house of a villager identified as Israel Ansari. A team of the local police reached the village and began investigation. At the time of investigation , a mob of people attacked identified person Israel and Jumman miyan and they both have received serious injuries. They were referred to the Rajendra Institute of Medical Sciences in Ranchi. The mob barged into 30 houses and ransacked them. They destroyed 17 bikes, one Bolero, one car and two tempos. Besides, a religious place was also attacked and some religious books were burnt. To control the mob, the police had to resort to lathi-charge and the District Magistrate imposed section 144 of CrPC to maintain law and order. Domchanch Police Station, FIR filed on the basis of complaint by Domchanch BDO Narayan Ram.